Little Squirrels Play Forest takes inspiration from initiatives such as Forest Schools whereby children are given freedom and independence, where the child leads the situation and evolves and adapts as a result. To help, we have various areas that are all designed to offer children a challenging yet stimulating environment where skills are learnt through play and experience. We have a sensory area, messy play, role play, water wall, building, outside area and more; all designed to provide our guests with a fun way to grow and develop and learn new tricks. We have areas for babies too! We exist to genuinely provide a service to you and your children that is of benefit to you both. We are avid believers in children learning by experience and structuring the best play by purely where their imagination takes them. We want to encourage you both to let your imaginations flow in our Play Forest, use what we have and make it into the best game ever. I am an Early Years Teacher who has over 10 years experience working with children of various ages. Working with children and enjoying watching them learn and develop inspired me to open my own Nursery. I love to help children learn through play, letting them explore and enjoy and watching their creativity blossom. I enjoy working with children for a number of reasons it gives me the opportunity to be creative, get messy, and be a positive role model for them. The days are never the same which I love. I love meeting new children/adults, and building relationships ensuring all children feel safe and secure and helping children develop their individual character and their learning skills. Working with children and also their families is such a rewarding job. Knowing you are having an impact on that child growing up, and helping that child reach their full potential is the best feeling in the world! I am currently finishing my Childhood Studies Degree and love putting my knowledge into practice with the children in our care. Working with young children is rewarding and challenging with new experiences happening every day. 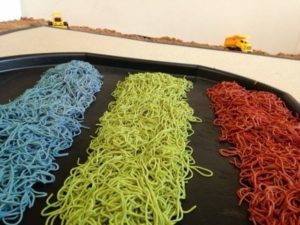 I love seeing how children expand activities and watching where there imagination takes them.